Cathexis has a vaguely interesting premise, but it gets a little bit too caught up in science-fiction high concepts and New Age mysticism. 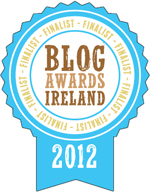 Once again, there’s a sense that the wrong writer has been assigned the wrong brief. The New Age spirituality elements of Chakotay’s character were largely championed by Michael Piller; the “romantic period mystery” story for Janeway clearly comes from Jeri Taylor. The only part of Cathexis that clearly comes from credited writer Brannon Braga is the somewhat generic “Invasion of the Body Snatchers“ plot line – and, as such, it seems to be the only thread in which Braga is particularly interested. So we get a bunch of half-hearted New Age stuff unfolding, with Chakotay’s wandering spirit represented by a camera with a blurry filter swooping through familiar sets. Once again, Chakotay’s Native American heritage becomes a launching pad for some ill-advised mysticism and exoticism, which Cathexis never even bothers trying to explain. Soul travel, or spirit walking, is considered both possible and natural within the context of the New Age movement. According to anthropologist Paul C. Johnson, the idea of soul travel or loss is used within the context of New Age shamanism to explain illness or the effects of trauma. Anthropologist David Hess suggests that while traditional science rejects the possibility of disembodied consciousness because consciousness is understood as the product of the body, New Agers have “a concern with relations between mind and body” not reducible to physicality. In Cathexis, the religious model and the medical/scientific model ultimately coexist, as the empirical evidence overwhelmingly suggests that Chakotay’s consciousness was disembodied. The New Age emphasis on the soul and the possibility of spirit walking is maintained. However, there is something that feels distinctly uncomfortable about the use of Chakotay as a gateway to these New Age ideas. As is evidenced by the Declarations of War released by Councils of Native American Elders in the 1980s and 1990s, the vast majority of American Indians, however, actively protest New Age appropriation of their religious beliefs and practices roundly rejecting the New Age belief that they are in a unique position to harvest the truths that lie at the core of these indigenous religions. These Native Americans consider the New Agers’ stance to be yet another attempt at colonialist power usurpation over who has the right to interpret, codify and define indigenous beliefs. Producer Michael Piller seems to have been the voice championing the more New Age aspects of Chakotay’s character. That probably accounts for why Braga seems particularly enthused at working with them here, and also why Star Trek: Voyager phased them out after Piller formally departed the show at the end of the second season. It was Piller who wrote The Cloud, featuring Chakotay guiding Janeway on a “vision quest”, based around his own experiences while taking a pain-management class to help with his back trouble. Chakotay is not one of Michael Piller’s finest accomplishments as a writer and producer, and it’s a shame that his legacy with Voyager is overshadowed by the problematic elements of the show’s first two seasons – Chakotay’s spirituality and the Kazon. (To the point where his attempts to give Voyager its own unique identity in those first two years tends to get brushed aside.) 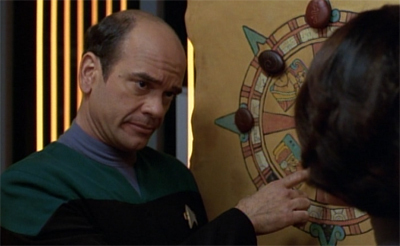 Still, it’s hard to blame Brannon Braga for his lack of enthusiasm about an episode in which the disembodied spirit of the ship’s Native American character floats through corridors. “A discussion of the inaccuracies in the First Nations culture and stereotypical views on Indigenous peoples depicted in the Cathexis episode alone would require its own book,” Sierra S. Adare scathingly remarks in a footnote to Indian Stereotypes in TV Science Fiction: First Nations’ Voices Speak Out. 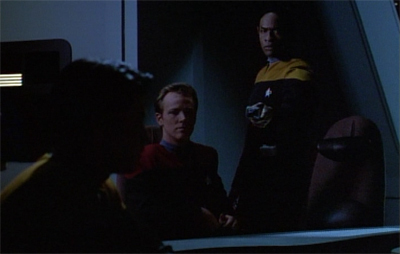 The whole episode is driven by the image of Chakotay’s disembodied spirit haunting Voyager, randomly latching on to crew members to protect the ship. Even overlooking the cultural issues with this portrayal of Chakotay, there’s some rather shoddy plotting at work here. How come only one alien takes control of Tuvok? The episode’s climax hinges on the idea that the aliens are some sort of community, so how come another didn’t try to claim Chakotay? not!Tuvok talks about how “the collective neural energy of [the] crew will sustain [its] people for years to come”, so how come Chakotay’s essence was just left floating through space? The reveal that the possessing force is Chakotay makes for a superficially clever twist, but it just raises questions. 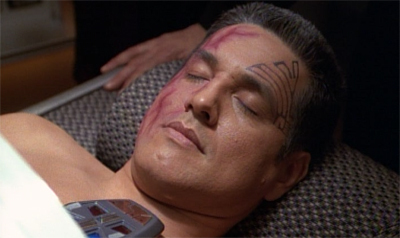 In the episode’s final scene, a revived Chakotay explains, “At first I could only do little things with the host’s body. Push buttons, work a console. As time went on, it became easier to do more.” One wonders why he couldn’t have simply possessed Paris to write the words “I am Chakotay – Tuvok is an evil alien”, albeit with a bit more elaboration; or why he could not have simply initiated Torres’ check of the shuttle logs that exposes Tuvok? Even the episode’s denouement seems a poorly constructed. Janeway comes to suspect not!Tuvok because the character has been acting out of sorts. “In three separate instances now, it’s assaulted you,” Janeway deduces. When not!Tuvok points out that he is the Chief of Security and Tactical Officer, Janeway responds, “So far, you’ve posed no greater threat than anyone else, and yet it keeps going after you.” Ignoring the rather cold criticism implicit in the observation, it feels a bit much upon which to make an accusation. After all, the suspicious instances began when Chakotay body-jacked Paris twice in quick succession – one on the bridge and once in Navigational Control. So while not!Tuvok is claiming that he has been attacked three times, it doesn’t seem too improbable. 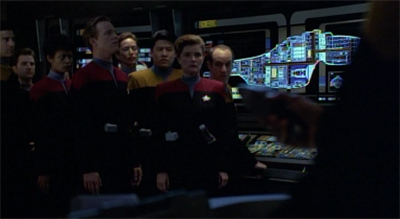 It would make more sense for Janeway to point out that Tuvok’s return to the ship brought the strange occurrences and that Tuvok would be the character to benefit from the splitting of the command codes to help manage the situation. As such, Cathexis seems rather shoddily constructed around a vaguely interesting premise. Brannon Braga is clearly more interested in the strange alien possession than he is in the New Age mysticism surrounding Chakotay’s wandering soul. And there is something vaguely interesting about this plot. It feels like the premise of a science-fiction b-movie, with a nebula full of monsters ready to feast on our characters’ delicious brains neural energy. 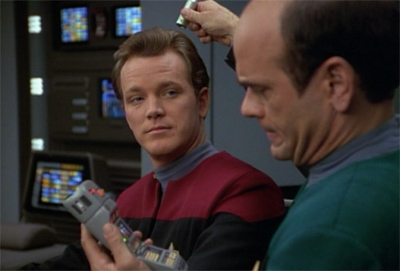 Michael Piller wanted to make it a story about paranoia, which sounded good at the time, but it’s hard to do a show about paranoia on a Starfleet vessel. People don’t behave that way. It was a complex story — as many of mine are— but I never quite had a handle on the logic of what was going on. The actors felt the lack of impact in the script and were trying to bring something to it, God bless them, but some of it was over the top. 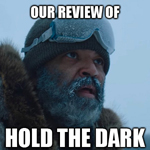 The director should have pulled them in. The paranoia subtext in Cathexis doesn’t work, but it doesn’t work for reasons distinct from those identified by Braga. The problems with the paranoia element of Cathexis have nothing to do with the difficulty writing paranoia on a Starfleet vessel. After all, the third season finalé over on Star Trek: Deep Space Nine, The Adversary, is built entirely around the idea of paranoia on a Starfleet vessel. However, it’s a very different form of paranoia. In many respects, The Adversary seems to have tapped into a contemporary type of paranoia, while Cathexis is built around more classical Cold War anxieties. The Adversary is built around an untrustworthy authority figure (Ambassador Krajensky) who winds up turning the Defiant against its crew. It is – like Whispers and The Search before it – built around the idea that people we trust are secretly using authority structures to undermine us and insidiously attack all that we hold dear. It’s a spiritual companion to the paranoia embodied by The X-Files, a sense that we are all alone in a world run by sinister hostile forces. 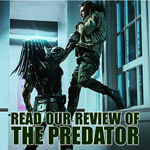 In these films the aliens came to Earth to possess human minds. This signifies a total absence of emotion, individual feelings, freedom of will, and moral judgment. In mythology, it evokes the concept of demonic possession. 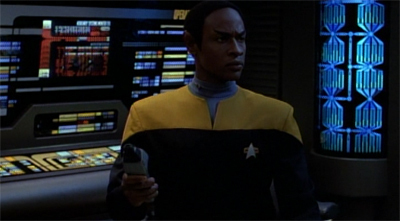 The only difference is that Tuvok – as a Vulcan – works from the starting point of “a total absence of emotion, individual feelings“, with episodes like Prime Factors even hinting that perhaps he has no “moral judgment” either. All of which is a very long-winded way of stated that Cathexis feels quite dated. Despite the fact that paranoia and mistrust was part of the American zeitgeist in the nineties, Cathexis appeals back to a more old-fashioned (and arguably outdated) form of paranoia. It’s another strange example of how disconnected Voyager feels from the nineties. Like the return to the classic Western aesthetic (complete with desert planets and primitive natives) in Caretaker or the nuclear anxiety of Time and Again or Jetrel, Voyager can’t help but feel a little quaint and dated. Cathexis also marks the introduction of Janeway’s holonovel. This is problematic on a number of levels. Along with Heroes and Demons, allowing the crew to escape into the holodeck undermines any real sense of peril or discomfort. Voyager might be stranded alone on the far side of the galaxy, but it still seems more like a luxury liner than a ship of exploration. Picard and Sisko had their own recreational activities, but there’s a sense that Voyager really should be in a more high-stress situation. Even then, Picard used the holodeck to help guide Data’s development in episodes like The Defector or Devil’s Due and invited Crusher and Data along in The Big Goodbye. Sisko used it to bond with his son or with other members of the station crew. 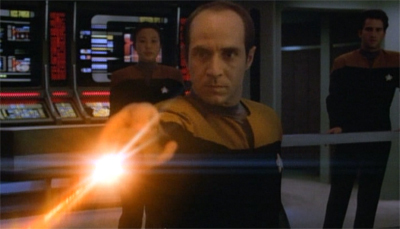 It is worth noting that Barcley’s solo use of the holodeck in Hollow Pursuits was seen as unhealthy by the rest of the crew. It’s strange that Voyager has been so casual about individual members of the crew wandering off into the holodeck, but it probably says something about the show’s approach to characterisation. From a plotting point of view, these early holodeck episodes feel a little weird. 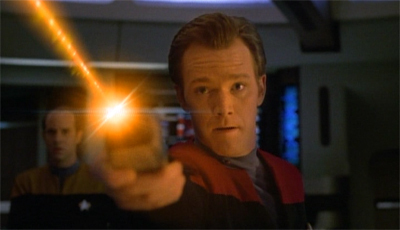 Harry Kim finishes up his shift and runs straight to the holodeck to role play Beowulf, but he does so by himself. He doesn’t take in an adventure with Paris, or lounge around a Parisian bar with his colleagues; he checks into a holodeck all by himself to play alone. That can’t help but seem just a little bit unhealthy, particularly on a ship that is going to be travelling so long with such a small crew; one would imagine fraternisation would be the goal. In practical terms, one wonders how holodeck time is allocated among the crew. Do senior officers get priority? Or is it on order of request? Or is it a lottery? Is there one holodeck reserved for official business or even group activities? These are the sorts of questions it might be fun to think about, and all are undermined by the attitude adopted by stories like Heroes and Demons and Cathexis. Janeway’s decision to indulge in her holonovel at this (relatively) early stage of the journey also seems to foreshadow some of her later characterisation. Janeway was a notoriously hard-to-define character, one prone to radical shifts in mood and outlook between episodes. However, perhaps Cathexis points towards Janeway’s occasional attempts to isolate herself from the crew in episodes like Night. If the first season characterisation of Janeway can be said to be at all consistent, she is treated first-and-foremost as a scientist. She seems more interested in techno-babble and pseudo-scientific phenomenon than she does with diplomacy or negotiating. Janeway is excited by strange anomalies like those encountered in Heroes and Demons or Parallax; in contrast, she tends to send other representatives of the crew on trade or diplomatic missions in episodes like Ex Post Facto and Cathexis. So maybe it makes sense for Janeway to retreat into the holodeck, away from the responsibilities of a nightmare command, to take the opportunity to get away from it all. It just feels weird that the show never seems to explore that aspect of the character. One would imagine that Janeway should be making a point to be seen with the crew during recreation periods, to demonstrate that she is aware of they day-to-day life on the Voyager. This is the sort of behaviour that paves the way for her breakdown in Night, so it’s strange that the show is so completely uncritical of it here. This woman’s looking like she needs serious psychological help. I started to lose respect for Janeway the moment it became clear that Janeway’s idea of “relaxation” is nookie with a fake English lord. Given that she played Lord Burleigh’s servant and mommied his kids, the tone of the story was sexist and downright masochistic. I worry about a woman who thinks it’s less degrading to have a relationship with an artificial construct than with a living, breathing person who happens to serve on a ship she commands. As much as Chakotay’s religious beliefs seem to play into clichés about Native American “mysticism”, Janeway’s fantasies seem to reinforce all manner of sexist clichés about women in authority. It seems that a woman can’t be strong and commanding without secretly yearning for a family or a strong hunky man. But Janeway’s holonovel marks a milestone in this virtual literature of the twenty-fourth century as the first holodeck story to look more like a nineteenth-century novel than an arcade shoot-’em-up. Unlike virtually all the holodeck stories run by male crew members, Lucy Davenport is not focused on a violent central conflict that is resolved within a single Star Trek episode. 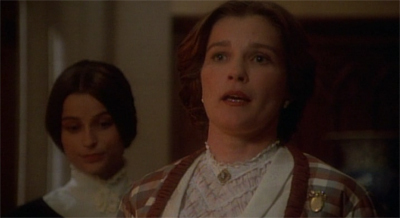 instead, Janeway is involved in a more leisurely and open-ended exploration of the Burleigh house-hold, a continuing avocation that she takes up regularly on her days off and that is presented over several episodes. 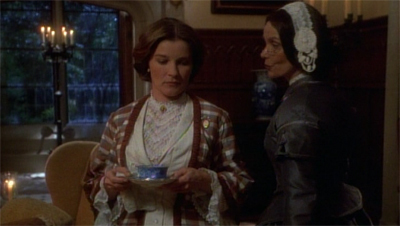 From Janeway’s references to events that are not dramatised, it seems that she is spending long periods of time in the household, participating in a daily routine, giving lessons to the children, having tea at regular hours, and getting to know each individual character. 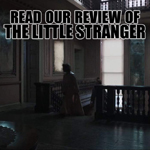 It is a rather novel use of the holodeck for something that seems to exist between the extremes of heavily scripted plot-driven drama (like Picard’s Dixon Hill or Shakespeare programs) or entirely plotless atmosphere (Paris’ Parisian simulation). In Manhunt, Picard lamented that he couldn’t just immerse himself in the world of Dixon Hill without the plot trying to advance around him. In Heroes and Demons, the Beowulf simulation seemed heavily scripted. Here, Janeway seems to be able to wade into a fictional world and explore it in her own time on her own terms. In many respects, this seems more like a role playing game than anything we’ve seen in the franchise before – perhaps suggesting something more in line with modern “free-roam” video games. It’s worth noting that Cathexis aired two years before the release of the most high-profile pioneer of these sorts of video games, Grand Theft Auto III, was released. That said, video games had been moving in that direction since the mid to late eighties. It is nice to get a sense that the holodeck has a diverse range of potential functions, and that there is something between plot-driven adventure and plot-less ambiance. Cathexis is also notable for the introduction of Durst – a character who will become more important in Faces. It’s amazing that the first season of Voyager has not worked harder to establish recurring characters, or to build up a supporting cast around our ensemble. Seska has defected to the Kazon and Joe Carey won’t be seen again in real time until Friendship One. Given that this is a show about a bunch of people trapped on a starship together, it feels weird that we haven’t gotten to know more than two people outside the senior staff. Sadly, Durst is not an exception. Although played by veteran television guest actor Brian Markinson, he seems to have been added into the script so as to give his appearance in Faces a bit more weight. Durst has no real personality of his own. 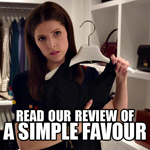 His lines could easily have been divided up between Paris and Kim without the episode missing a beat. 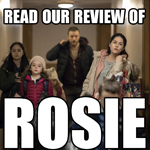 It’s a very utilitarian approach to guest characters – introducing them only an episode or two before they are needed. 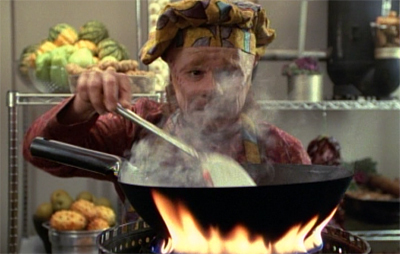 While this approach to guest characters seems much more purposeful than any of the expansions to the cast of Deep Space Nine, which seemed to introduce characters with the vaguest idea of what it might do with them, it also explains why there are really no recurring players who last the full seven years of Voyager, barring Ayala. And although Ayala appears in the background throughout the show’s run, he seldom gets any lines, let alone any character development. Cathexis is a mess of an episode, with lots of little interesting facets that are undermined by the fact that there doesn’t seem to have been too much thought in how they all fit together. It’s funny you mention LARPing in the holodeck! I remember watching SFDebris’ scathing video about ENT’s “These Are the Voyages…” which pointed out how the private lives and conversation of these hapless crewman have been recreated for Riker and other future voyeurs to go plodding around in. It struck me that Riker also participates in a phaser battle with Archer and stands by in the galley while Trip is killed. Is this not the equivalent of an FPS shooter with historical domains characters? All of Darren’s replies begin with the word “Yep”. Yep. I think it’s important to emphasise the common ground with commentators and to acknowledge that they frequently make good points. (Like pointing out that I do begin most replies with “Yep”, which is a valid point and a good observation.) I find internet discourse can often seem unnecessarily adversarial, even when discussing ground that is largely common between people. With that in mind, I typically open with “yep” to convey that I agree significantly (or even entirely) with the point made before I engage in a bit of discussion around it. Cathexis is more interesting than Lonely Among Us, but doesn’t quite find the paranoia of Invasion of the Body Snatchers, The Thing or even The Faculty. Robert Beltran enjoyed the episode for getting to save Voyager by being a noncorporeal spirit; by the way, Cathexis is Greek for occupation. Is it just me or does Paris look like he’s wielding a light-sabre instead of a phaser? This is the second episode in a row where a key character doesn’t get to deliver any dialogue until they’re very last scene. Was “Tuvok” saying he’s been possessed or assaulted three times? And was Mrs Davenport a housekeeper or a governess? 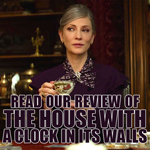 Good call on the housekeeper/governess thing. Corrected, thank you! That’s a fair point about the assault/possession of Tuvok. 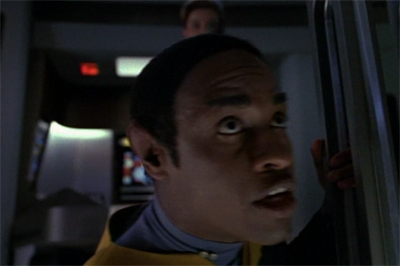 Janeway uses the verb “assault”, but it comes directly after Tuvok claims that he must have been possessed while attack Kes. But I think you’re right. It’s been a while since I’ve seen the episode; the three times are (a.) on the shuttle; (b.) in the turbolift with Kes; (c.) on the bridge before Tuvok stuns them all, right? Small question: Does the computer scan brain waves all the time? Or how could the Doctor analyze Paris’ and Torres’ memory engrams for the preceeding 24 hours? Or how is a memory engram measured so precisely? 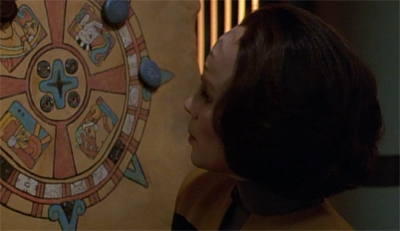 Still, Janeway’s cathexis with a telenovela story foreshadows problems of the series’ handling of her characters – and it is an interesting thought to link this to her retreat in Night (which is not only for this retreat, but generally a great episode in my recollection, but I will see what my rewatch makes out of it). And one outstanding feature chilled me as a child: The wide band dispersal shot by Tuvoks phaser… cool effect! And how handy in those dense fights – and so reminiscent of the Original series. And strangely it was never to be seen again, if I remember correctly. Yep, one of those early examples of “Voyager has a solution for this one situation that should radically change the way that the universe works, but doesn’t” moments. That said, I think you can see something similar in the user of the room-sweeping phasers in Homefront and Paradise Lost, maybe? Oh yeah… forgot those. 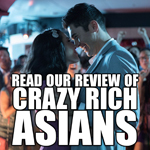 It would make sense from a production chronology point of view, too.